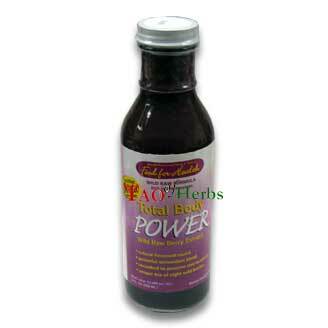 Total Body Power supports health through the power of wild berry flavonoids. Research shows that flavonoids, the active ingredients of wild berries in Total Body Power are exceedingly rare and are handpicked in wilderness. The berries are picked exclusively from wild remote regions. This is a powerful berry extract-anyone can tell from the sun and wild nature. Because it is raw enzymes, vitamins, minerals, and flavonoids are intact-completely unaltered. This is the only certified wild 100% raw berry extract available. Total Body Power supports healthy immune response, intestinal health and healthy vison. take one to two tablespoons every morning with breakfast. For maintenance take at least one tablespoonful daily. Mix with raw honey and add to yogurt. wild blackberry extract, wild honeysuckle berry extract, wild chokecherry extract, wild red raspberry, wild organic blueberry, wild or organic balck raspberry, wild serviceberry, wild lingonberry.